Enjoy outstanding sound and playability. Order today. This might be the best guitar purchase I have ever made - in a lifetime of purchasing arch tops, classicals, acoustic steel strings, and gypsy guitars. If you are an improvising finger style player and enjoy playing on nylon, this flamenco design will solve many problems. First, it sounds great, well balanced throughout the tonal range. 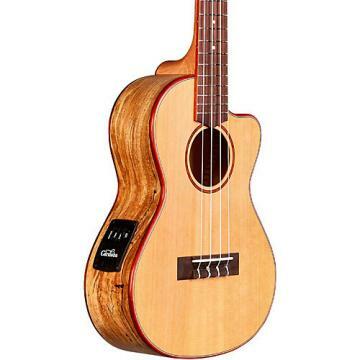 Amazing bass response for such a small-bodied instrument. Flamenco guitars play more easily than classicals, and that fact suits me esp. as I'm primarily a jazz player. Also, the Fishman pickup is great, and even came to me with a 9v battery already installed. The very high quality hard case is black with a slightly bumpy texture to it, so it will not display scuffs or cuts. I cannot believe that Cordoba could offer this guitar at this quality for around $1300. I would especially recommend this guitar for younger people or women who might enjoy this small-bodied size guitar because it's so much easier to play. Kudos, also, to the staff of Custom Guitars Friend who enabled me to exchange a different and unsatisfying classical guitar for this gem, under complicated extenuating circumstances.